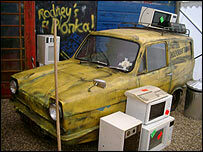 A Reliant Regal three-wheeler used in the hit TV comedy Only Fools and Horses has sold for more than £40,000. The battered van, emblazoned with the sign Trotters Independent Trading Co, went for £44,227 - more than double its original estimate. The 1972 model, the second made for the show starring David Jason as Del Boy, was used from series six onwards. It was sold at the Coys of Kensington specialist car auction at the Royal Horticultural Hall in London. The Reliant, one of three used in the series, featured in the classic episode where characters Del Boy and Rodney dressed as Batman and Robin. Created by John Sullivan, seven Only Fools and Horses series were broadcast between 1981 and 1991, with sporadic Christmas specials until 2003. Also under the hammer at the car auction was a 1960s Batmobile which sold for almost £120,000. The vehicle, which had been estimated at £75,000, attracted overseas telephone bids but eventually sold to a bidder at the auction. It was built in 1966 to tour the USA, promoting the TV series starring Adam West as Batman and Burt Ward as his sidekick, Robin.